Last month, the Etrange Festival presented Aleksei German’s sixth and last film, Hard to Be a God, an artistic testament on several accounts. It took the director nearly 15 years to complete: after releasing Khrustalyov, My Car in 1998, German spent seven years shooting in the Czech Republic, with additional interior scenes shot in Moscow, followed by six years of editing. He literally put his life into the film, as he died in February 2013 during the last stage of the editing, which was then completed by his son Aleksei Junior. But Hard to Be a God is more than just his final film: German had been thinking about adapting Arkadiy and Boris Strugatskiy’s successful novel virtually from the moment it was published in 1964, coming up with a first script as early as 1968, which failed to pass the filter of Soviet censorship. One can easily imagine how familiar an echo the persecution of all intellectuals in the fictional Kingdom of Arkanar might have sounded in the late 1960s when, after a relative thaw during Khrushchev’s era, Brezhnev restored the stranglehold on information and academia with new Stalin-like trials of writers in 1966. The book tells the story of scientists supervising a planet whose evolution has reached the stage of the Dark Ages, but where the Renaissance has not happened, as we are told at the beginning of the film. All those who can read and write are persecuted and executed, and Don Rumata, the visiting observer who is forbidden to interfere, suffers because of his despair and helplessness at improving their civilisation. In contrast to the previous adaptation of the novel by Peter Fleischmann, Es ist nicht leicht ein Gott zu sein in 1989 (which German may have seen, as Andrei Boltnev, who played the titular character in German’s 1984 My Friend Ivan Lapshin, also played Budach in Fleischmann’s film), German chose to reduce the science fiction plot to almost imperceptible hints. This invites comparison with Andrei Tarkovsky’s adaptation of another of the Strugatskiys’ novels, Stalker (1979), not so much because of the common source, but rather because both directors opted for a minimalistic treatment of the science fiction genre. German’s cinematographic language, which he had so masterfully perfected in Khrustalyov, My Car, combines black and white wide shots reminiscent of Grigori Kozintsev’s Shakespeare films (which is not surprising, as German had studied with him) and the painstakingly precise construction of long shots and relentless camera movements already used in his previous films – which may also have influenced Aleksandr Sokurov’s Faustus (2011). The images are conjured up to present the civilisation of Arkanar in as odd and uncanny a way as possible, leaving the spectator with the difficult task of interpreting the puzzling actions that unfold on the screen. 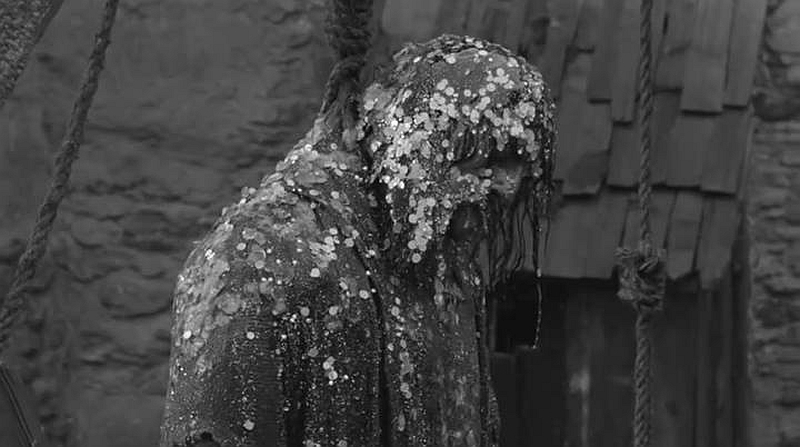 The first two shots of the film set a stark contrast: the black and white beauty of a mountain village overhanging a snow-covered lake, worthy of a Brueghel winter landscape, is immediately followed by the filthiness of the streets where two characters get happily splashed with excrement by a man using his first floor window as a latrine. Throughout the film the muddy, rainy and dirty moistness of the urban environment is echoed in the social conventions of spitting, sneezing, belching and farting, added to the bleeding, gutting and poisoning of brutish violence. Often felt as salutary for the spectator, the choice of black and white, or rather infinite shades of grey, provides a visual echo of the colour and meanness of Don Reba’s guards and ministers, who persecute all forms of culture. This disquieting atmosphere has a hypnotic effect, endlessly dragging the spectator through closed, stifling, claustrophobic indoor spaces, crowded with a cornucopia of objects scattered across rooms and hanging from ceilings, which the protagonists spend their time avoiding bumping into, while minor characters do all they can to divert attention from the main story, even making signs to the camera. In the novel the real experiment is not observing the barbarians’ evolution, but determining whether the evolved scientists from Planet Earth are likely to regress to a state ruled by emotions. Unsurprisingly, the film’s climax – Don Rumata’s bloody intervention – is reduced to one unique killing, the rest being relegated to an ellipsis, which is probably why German renounced the alternative title of History of the Arkanar Massacre. Rumata’s failing is inscribed into the film’s framing structure: it opens and closes on a snowy landscape, but the innocence of the initial lake is contrasted with another snow-covered countryside where death is omnipresent. A further framing element is the Duke-Ellington-like jazz music played by Don Rumata on an odd and anachronistic clarinet, the only tangible sign of his modernity, rejected by Rumata’s slaves plugging up their ears, and the last words of the film, a little girl complaining that the music makes her retch. But the spectators will know better: this three-hour baroque and nauseous journey through mankind’s worst nightmares is a lesson in cinema and humanity that one is not likely to forget. This review was first published as part of our Etrange Festival 2014 coverage. The Tribe is a homespun indigenous Ukrainian film that is a sad, shocking and undeniably harrowing dramatic reflection of Ukraine with the searing truthful lens of a stylistic documentary treatment (at times similar to that of Austrian auteur Ulrich Seidl). Focusing upon children, the most vulnerable victims of Russia’s aforementioned oppression, this is a film that you’ll simply never forget. Set in a special boarding school, it paints an evocative portrait of students living within a tribal societal structure (literally as per the title) where adult supervision is minimal at best and even culpable in the desecration of youth. Living in an insular world, carved out by years of developing survival skills in this institutional environment, the kids have a long-established criminal gang culture and they engage in all manner of nefarious activities including, but not limited to, thieving, black market racketeering and pimping. Writer-director Myroslav Slaboshpytskiy’s mise en scène includes long, superbly composed shots and a stately, but never dull pace. This allows the film’s audience to contemplate – in tandem with the narrative’s forward movement – both the almost matter-of-fact horrors its young protagonists accept, live with and even excel at while also getting a profound sense of the ebbs and flows of life in this drab, dingy institutional setting. In a sense, the movie evokes life as it actually unfolds (or, at least, seems to). The violence is often brutal and the film never shies away from explicit sexual frankness. We watch the beautiful teenage girls being pimped out at overnight truck stops, engaging in degrading acts of wham-bam without protection, perpetrated against their various orifices by truckers who shell out cash for the privilege. Even more harrowing is when we follow the literal results of this constant sexual activity and witness a protracted unsanitary and painful abortion. While there are occasional moments of tenderness, especially in a romance that blossoms between one young boy and girl, there’s virtually no sense of hope that any of these children will ever escape the cycles of abuse, aberrant behaviour and debasement that rule their lives. The performances elicited by Slaboshpytskiy are so astonishing, you’re constantly in amazement over how naturalistic and reflective of life these young actors are, conveying no false notes with the kind of skill and honesty one expects from far more seasoned players. The special circumstances these children are afflicted with also allows Slaboshpytskiy to bravely and brilliantly tell his story completely though the purest of cinematic approaches. Visuals and actions are what drive the film and ultimately prove to be far more powerful than words ever could be. Chances are very good that you’ll ultimately sit there, mouth agape as you realize that what you’re seeing on screen is unlike anything you have ever seen before. The Tribe evokes a world of silence and suffering that is also perversely borderline romantic, a world where connections and communication are key elements to add some variation to a youth culture that is as entrenched as it is ultimately constant and, frankly, inescapable. This review is part of our TIFF 2014 coverage. Continuing his exploration of the dark heart of the Russian people, Loznistsa constructs a brutal but paced affair. Reminiscent of The Killers (1946) in its opening act, the film unravels to show exactly how the darkness operates – In the Fog can almost be considered a companion to Loznitsa’s previous work – the bleak landscape reminiscent of the road in My Joy, while the guilt the characters carry can be seen as being handed down through the ages. Although the deliberate pacing might put off viewers, those willing to invest their time will find a film that’s dripping with atmosphere: eschewing the black-and-white morality of big-budgeted epics, Loznitsa constructs a personal journey to hell. The cinematography washes the barren landscape out even to the point of indiscrimination – these places are beyond the audience’s imagination. The harsh winter is reflected in the way the light constantly bleaches the surroundings. The lengthy takes almost dare the audience to look away, while the performance of Vladimir Svirskiy is nothing less than mesmerising: his take on a man whose guilt has long been assumed before any proof is produced is both angry and laden with the weight of a thousand resignations. The other mention must go to Grossmeier, played with aplomb by Vlad Ivanov, who is perfect at bringing the phrase ‘the banality of evil’ to life. His cruelty, the moving force of the tragedy on the screen, is indeed one of the most affecting performances anyone can hope to see on the big screen this year. All in all, In The Fog is one of the most impressive films of this year, a brutal tale told in the most languid language imaginable. Unmissable and a terrific step forward for Sergei Loznitsa. In Mirror there’s always something happening, and it’s usually surprising and strange. As I’m watching Tarkovsky’s 1975 masterpiece Mirror on the TV in the bedroom, the sounds of Warner Bros cartoons are echoing through from the living room, where my partner Fiona is watching the amorous adventures of animated skunk Pepe le Pew on YouTube. And I hold back a pang of jealousy, because I’ve been taught to associate Tarkovsky with effort and Chuck Jones cartoons with relaxation. But this is wrong: my whole cinematic philosophy is based on an unreasoning insistence that there’s no difference between films in which a black lady cat gets a stripe painted down her back due to an improbable plot contrivance and is mistaken for a skunk, and films in which a series of images form a stream of consciousness/unconsciousness, taking us from an exercise in mesmerism to a rainstorm outside a print works, to a book containing a Leonardo drawing left on a table outside in a wood. A man who sold movie posters told me at an impressionable age that he gave up seeing Tarkovsky films after Andrei Rublev, because his interest in films was an interest in enjoyment. I also require some form of pleasure in cinema, but in fact I find, as I belatedly get to some kind of tentative grips with Mirror, that Tarkovsky, though not enjoyable in entirely the same way as a skunk who sounds like Charles Boyer, offers rare and interesting pleasures. 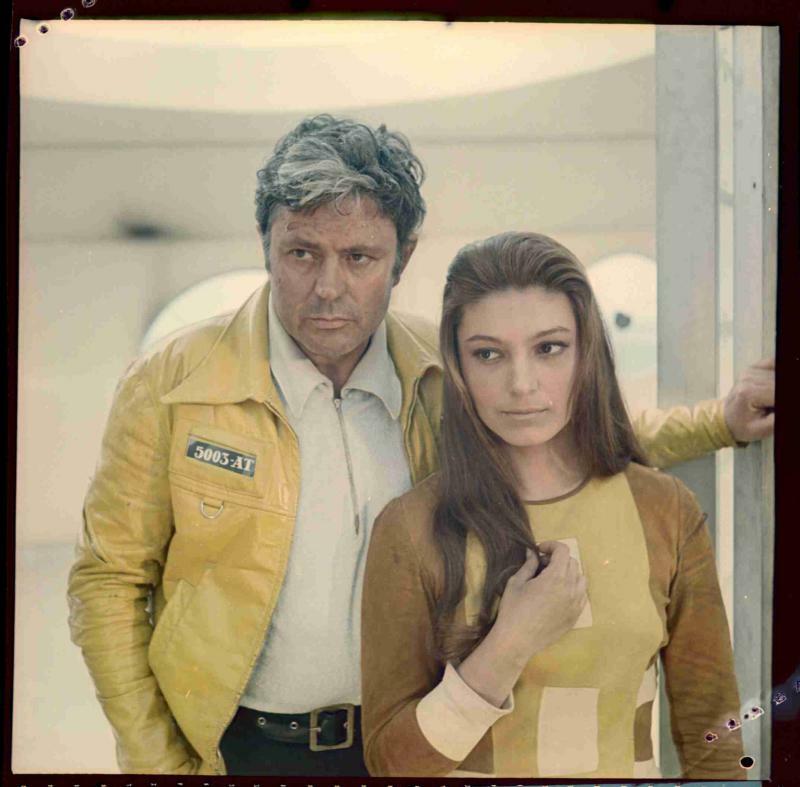 First, Mirror isn’t long in the way that Solaris (the first Tarkovsky film I saw, pan-and-scanned on Channel 4 when I was a teenager) undeniably is. At a modest 100 minutes it’s about the length of 15 Pepe le Pew cartoons. And while it’s customary to call Tarkovsky’s films slow, this one isn’t slow in the way that The Sacrifice, my second Tarkovsky viewing experience, is slow. By that time, Tark (I call him Tark) had evolved an approach almost calculated to alienate a sensation-hungry teenage boy, filming dialogue scenes from too far away to see the actors’ faces, with a camera that moved too slowly to really offer a discernible sense of momentum or development. You became aware that the composition had changed in the way that you notice that the minute hand of a clock has moved. My teenage self wasn’t impressed by Tark’s five-minute opening tracking shot, since I calculated that his camera covered less ground in that time than Max Ophüls would get through in a whole reel. But in Mirror there’s always something happening, and it’s usually surprising and strange. And Margharita Terekhova’s face is paid close attention by the camera, her baleful eyes fixing us and her unconsciously active mouth, chewing her own lips or twitching through smiles and frowns at double-speed, creating an effect just as hypnotic as those slightly slo-mo tracks down corridors in the printing plant. And I was also noting the weird and possibly destructive influence the film had obviously exerted on other filmmakers. The child, backlit in a doorway by a blaze of orange, must have caught Spielberg’s eye because he used it in Close Encounters of the Third Kind. A shot where Tarkovsky moves from a reflection of the window, opening on what seems to be a dry day, to the window itself, which reveals a rainstorm, as if an amount of time had passed (hours, days, years?) during that single shot, bending time in quite an Ophülsian way, might explain what’s usually thought of as a continuity error in Spielberg’s UFO epic, although if it’s a homage it’s a resolutely inexplicable and pointless one. And the oneiric, almost paranormal rainstorm that breaks out, advancing like an invisible monster across the landscape, reminded me of Lars von Trier’s Tarkovsky dedication on his ill-thought-out film Antichrist, which features, in one scene, an inane walnut downpour. And a palm print slowly fading from a shiny surface, and a child viewed from a window advancing into a rural landscape, made me suspect that Lynn Ramsay had based her entire film Ratcatcher on a series of pilfered moments from Mirror. What all those filmmakers do succeed at, I suppose, is presenting their swipes with a level of confidence that inspires trust, which Tarkovsky also does with his own, original images. Rather than following the logic of cause-and-effect storytelling, or openly interpretable symbolism, he assembles sequences answerable only to his inner sense of cinematic beauty, whose meaning is irreducible and can only be got at by looking at what’s there, and listening to it. So he’s not a difficult filmmaker, really, but the light bulb will go off probably at the end, or after the end, and not from interrogating the action for meaning but by meditatively subjecting yourself to it. There is stuff you can figure out. Since Mirror‘s protagonist is essentially an off-screen presence, talking to the actors from behind the camera, it’s a moment of revelation to spot the Andrei Rublev poster in his home and realise he’s Tarkovsky. Knowing that the poetry read on the soundtrack is written and read by Tarkovsky’s father only comes from reading up on the film afterwards, but I did manage to recognise the opening of Dante’s Divine Comedy in there, which helped me see the film as an artist’s journey through the imagery and personalities of their world, inner and outer life interweaving and blurring. I think my teenage self might have liked Mirror, because he was impressed by technical feats, and the film is full of them. Tarkovsky likes long takes, and he likes the impression of things happening naturally, and the way he creates the latter effect, which might seem to be ruled out by the choreography of a long, complex camera move, is to do things so technically troublesome that the mind simply refuses to accept that they could have been engineered, so they must have just happened. A wind ripples the grass at just the right moment; and an unattended bottle rolls off a table of its own accord, in the middle of a long camera move that will reveal to us a building on fire. Like a magician, Tarkovsky deceives us by taking such an improbable amount of trouble to do something that we are forced to assume it must have been achieved some other way. And it all follows the logic of sound and image and has a unique rhythm. Through Mirror, I feel like I’m coming to Tarkovsky for the first time, and am intrigued to return to the films that frustrated me when I was too immature to accept them. This review was first published for the release of Mirror as part of Artificial Eye’s Andrei Tarkovsky Collection box set in June 2011. Tarkovsky’s first feature-length film established him immediately as a major new talent in Soviet and world cinema. A boy, a war orphan, dressed in tattered clothing and shivering, is brought before a young officer, who tries to find out who he is. The boy insists that the captain alert his superiors and upbraids the captain for his scepticism, warning him of repercussions. Disconcerted, the captain finally gets through to the right officer and he is told to treat Ivan well, and that someone will pick him up. Ivan, apparently, is an asset and something of a hero. He is also the result of total war. His family has been killed in the conflict and his only function now is to help facilitate the military operations of the Soviet army. With his blond hair and ferocious and obstinate zeal he could just as easily be a poster boy for the Hitler youth, except that youth is a superficial accident with Ivan. In fact, the childhood of the title is problematic, a part of his life that seems as distant and unapproachable to Ivan as it is to any of the war-weary adults with whom he fits in. And yet he is still a child, who has dreams and on occasions nightmares, and who greets his officers, his handlers, with a hitherto unsuspected emotional warmth, leaping into Captain Kohlin’s arms when he arrives at the dugout. It is the adults who define childhood for Ivan. It is the young captain who alone in the film (and then only at the beginning) treats Ivan like a child, doubting and scolding him and finally carrying the exhausted boy to his bunk. Ivan’s superiors are obviously emotionally invested in him, desperate that he be removed from the front to a military academy in the rear, a plan Ivan predictably has no time for. 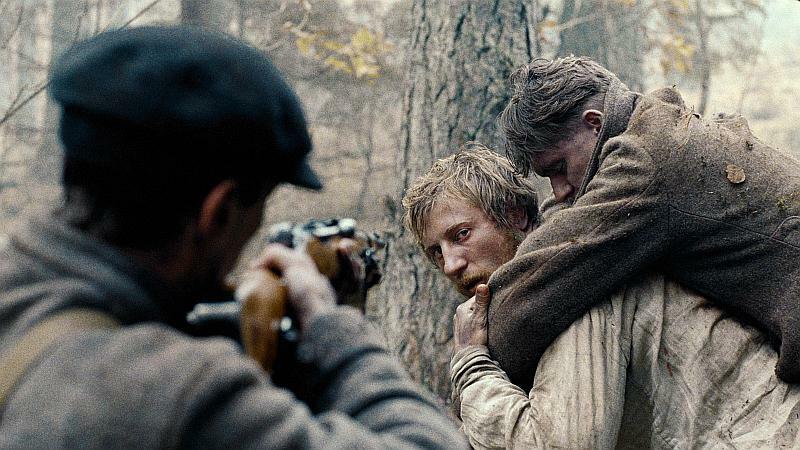 Ivan had joined a band of partisans earlier in the war, has witnessed a death camp and has run a number of missions across the river: what could a military academy possibly teach him about war? Ivan runs away when they appear intent on this plan. In a startling vignette, he meets an old man standing in the ruins of his house, looking for a nail with which to hang a picture. The futility of attempting to maintain ordinary life seems confirmed, and once Ivan is found, it is agreed he will be sent on another mission. Ivan’s pre-war childhood is given to us in a series of dreams: a beautiful opening sequence of Ivan taking flight, his mother at a well, on an apple cart with a girl in ridiculously torrential rain, horses on the beach eating apples. Each sequence has an understandable oddness - the too heavy rain, his mother’s poetic story about the star in the deep well, ‘it’s day for us but night for the star’ - and the summery quality of the brightly lit imagery contrasts with the darkness and wintery grey of war. And yet, the uncanny nature of dream seeps into the portrayal of war, not least in Ivan’s own status as a hardened war veteran who the adults ultimately defer to. The dugout is a rag-and-bone shop of the soul, a place where men wait to go and die, bored, tinkering with gramophones and listening for the bombs. Outside, trucks lurch about in the mud, and flares are sent up and drift one after the other with numbing regularity. The quick stab at a romance seems half-hearted and desperate at the same time. Masha is in charge of the hospital, ineffectively in charge, according to the young captain who is obviously in love with her and looking for any excuse to send her away from the fighting. Captain Kohlin also makes a pass at her, kissing her as he holds her over a trench, her feet dangling. The wish for love is as forlorn as the wish for a normal childhood for Ivan or the old man’s search for a nail. The culmination comes with the final crossing of the river, a sequence that takes on a mythological resonance. It is after all an actual Styx, with two dead Russian soldiers hung at the bank with a placard proclaiming ‘welcome’ in German. To this is added the mist, the flares that land ever closer, the relentless panning shot that accompanies the soldiers and Ivan in the boat, and Tarkovsky’s masterful use of sound. Throughout the film, sound has played a role; the dripping of rain water or the cracking of logs in a stove evoke not only place, but the heightened perceptions of men who are living every day as if it were their last. 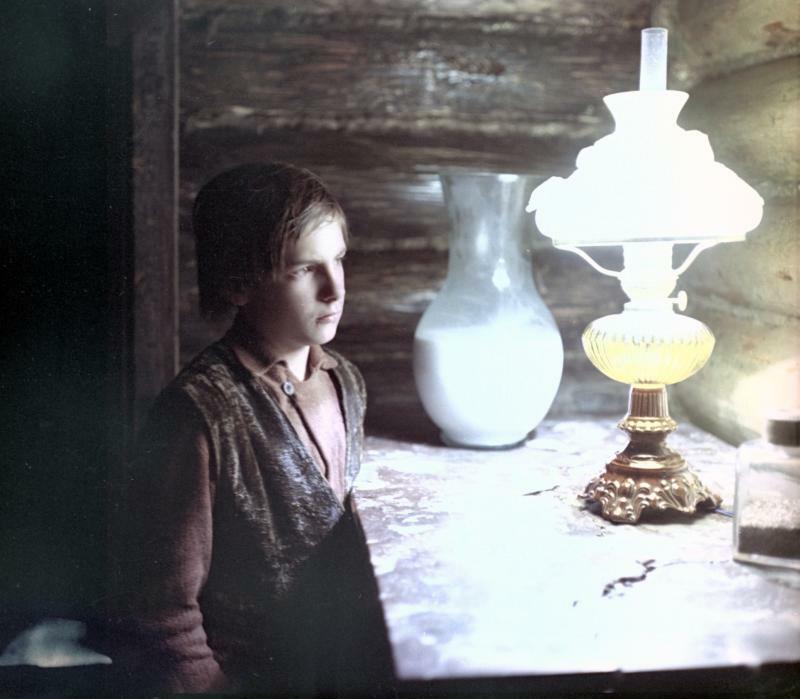 Tarkovsky’s first feature-length film, Ivan’s Childhood established him immediately as a major new talent in Soviet and world cinema. It won prizes at several festivals as well as taking the top prize, the Golden Lion, at the Venice Film Festival where it premiered in 1962. Tarkovsky benefited from circumstance; a thawing of the political situation allowed for the film’s more critical depiction of the war, and an earlier version of the story had been abandoned, leaving the door open for him. In a way it was a false dawn for Tarkovsky, whose relationship with the Soviet authorities would become increasingly problematic, leading him to make his last film, The Sacrifice, in Sweden. Ivan’s Childhood remains a stunning debut, a moving and immersive film that both denounces war and evokes its dreamlike beauty. 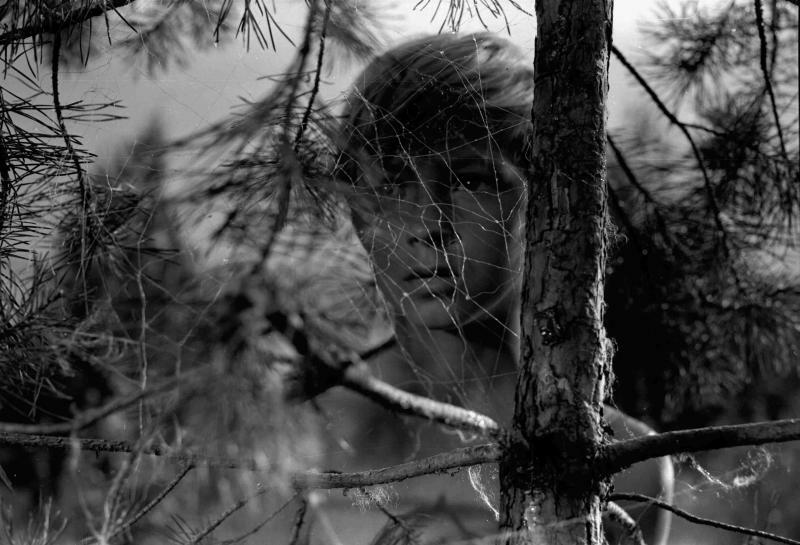 This review was first published for the release of Ivan’s Childhood as part of Artificial Eye’s Andrei Tarkovsky Collection box set in June 2011. Solaris is science fiction for people who don’t like science fiction. This justly famous film is based on a Polish novel from 1961 by Stanisław Lem, which first appeared in English in 1970. Both are science fiction for people who don’t like science fiction. The film is easier to enjoy if you don’t know the book well. Tarkovsky’s work here is often brilliant, especially when there is not much happening, but he is erratic in his handling of the plot and clumsy with dialogue. The screenplay changes quite a lot of the mechanics and details of Lem’s story: sometimes it seems as though the writers have misunderstood the book, more often as though they are trying to correct it, and this usually has the effect of substituting crudeness for subtlety. The worst bits are the talky passages, in particular a sub-Dostoevskian scene where the characters sound off bitterly and sarcastically at each other. And towards the end, the characters seem to be trying to explain the film to us by means of meandering philosophical ponderings. There are problems with the acting - plenty of hammy moments, and a general sense that the actors are not quite sure what they’re aiming for. A notable exception to these criticisms is the luminous Natalya Bondarchuk: the director himself observed that this 21-year-old fresh out of drama school outshone the rest of the cast. The best bits are not just those with no actors on the screen, but also the mainly silent scenes, central to the story, between Kris the spaceman and Hari the woman from his past. A couple of dream/hallucination sequences are inspired additions to Lem, in terms of imaginative vision if not of content. The most striking invention is a weightless scene of great beauty and mystery. And with the exception of the dialogue scenes, the film is a visual tour de force. About two hours in (!) it really takes off, as the director seems to forget about getting the story straight and contents himself with making strange and beautiful variations on themes of doubt, unease and illusion. For all its faults, this is an extraordinary film. But, especially if you admire the book, you might prefer the 2002 remake by Steven Soderbergh, starring George Clooney and Natascha McElhone. It concentrates on the crucial relationship between Kris and Hari, and it supplies what Lem and Tarkovsky both fail to come up with: a really excellent ending. If buried in you there are any feelings of regret or remorse about ended relationships, be ready to have them unearthed. The remake manages, like the book, to convey the sense that this work of science fiction is perhaps not really about strange happenings in an imaginary future, nor even about man and the unknowable universe, but about love and loss and memory in our own lives. This review was first published for the release of Solaris as part of Artificial Eye’s Andrei Tarkovsky Collection box set in June 2011.